Minnesota Ice Fishing Packages include cabin lodging with heated ice house rental and all taxes. 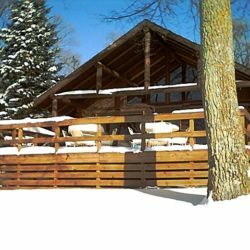 Minnesota Ice Fishing Resort Packages offer cabins with ice house rental and all taxes. Each cabin includes one bed per person and bath towels. The ice houses rental in this package have six fishing holes and we always clean your fish for free. Per person rates for your group. 4 Evergreen I or II 1 $1216 $304 per person based on four guests. 10 Shoreview or Heritage 2 $2830 $283 per person based on ten guests. Resort luxury cabins and heated ice houses are available between February 2nd and March 15th. No sleeper houses. Price includes two nights lodging with two days heated ice fishing house and all taxes. Prices per person based on cabin minimum: 4 guests 1 ice house $203. 6 guests 1 house $179. 6 guests 2 houses $226. 8 guests two houses $203. 10 guests two extra large houses $206. Large reunion lake homes with 10 to 15 beds and smaller cozy cabins with 4 to 6 beds provide a warm clean stay. Packages available including lodging & ice house rental for groups of 4 to 40. Call us to customize your package. Sorry no sleeper ice houses available, we do not have sleeper ice houses. A 30% credit card deposit and signed rental agreement are due at time of reservation. Based on availability. Winter Cabin and Reunion Lake Home Rates with no ice house rental. Weekly Rate, Stay five nights and receive the next two nights free. Ice Fishing Shanties – Custom built, lighted, propane heated deluxe shanties. Cabin guests check-in is 12 noon for cabins and ice access and check-out is 9 am. Please let all guests know to make your travel plans for 12 noon arrival. Early arrivals between 9 am and 12 PM may be accepted if arrangements are made with the office before your date of arrival. There will be a 1/2 day lodging rate charge for your early arrival between 9 am and 12 PM. Other early arrivals, not approved by the office are not available. 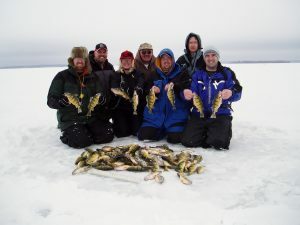 Adventure North Resort outside Walker, MN is among the Finest Ice Fishing Resorts In Minnesota Located On Leech Lake. Are you renting a cabin and bringing your own portables or wheel houses? No problem, we have plenty of plowed roads. Whether you are here for the fishing or the serenity of the winter snow in the North Woods, we bring out your adventurous spirit. After your day on the lake, sit back and relax while we clean your fish for you ~ ready for dinner or travel, just let us know how you like ’em. A 30% credit card deposit and signed rental agreement are required at time of reservation. If you find it necessary to cancel your reservation after submitting a deposit, your deposit will be refunded once all cabins are booked at regular rate for the date of your reservation less a $40 administrative charge and any credit card fees. Any reservations cancelled within 21 days of arrival will be charged the full lodging rate and taxes. No Refunds For Early Departure. All ice houses reserved must be paid for in full, no cancellations. No refunds for ice house cancellation. Reserve the entire resort for your corporate group, family reunion, or private retreat, we have the capacity of 51 to 75 guests.